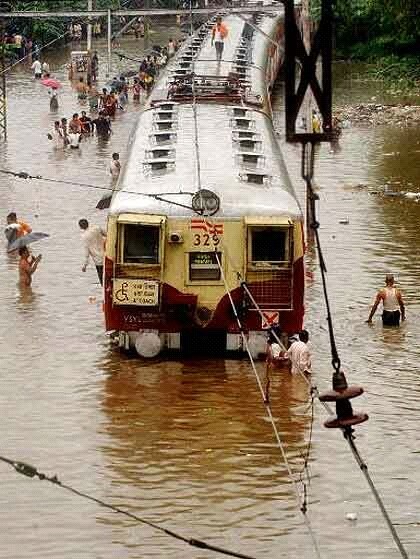 This is what mindless construction on the Mithi river of Mumbai led to back in 2005. 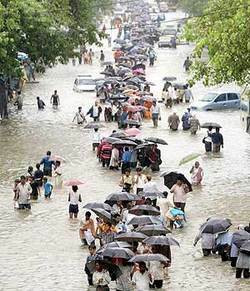 The land-deprived city of Mumbai – a city lying adjascent to a sea! – now faces the flood crisis every year. Coming back to Delhi – we have been ‘planning’ a similar fate for the city as well. It is therefore requested to the Government and to the concerned authorities to take note of the same and – STOP the construction on the Yamuna floodplains – leading to an ecological deconstruction of the floodplains and of the entire city. Image courtesy a concerned citizen from Mumbai via Email. The issue of governments allowing the building on flood plains is an international problem and an interesting dilemma. The London authorities are also well ahead on plans to build 10s of 1000s of houses of the Thames flood plain. Considering the record floods England has had over the last month this idea is obviously complete madness! Me….am right here…just that am pretty disgusted with how some of the things are going….and am a li’l worried I might post something that may be right…but be so offensive to some…that its held against me!! > am a li’l worried I might post something that may be right…but be so offensive to some…that its held against me!! Really?! Not sure who you are referring to but just do as you feel is right. I’m over in Norway at the moment (just a week) and they have had lousy weather here too. Seems the planet is not too happy with the human species at the moment! The silence’s been killing me too…there’s so much happening that needs to be reported…. (and mailed to people and places). But would still stay shut for the next 10 days now….with an undying hope.